PHUKET: The unfortunate plight of Racha Yai island has been in many media outlets – both Thai and English – of late. The stories are about its many environmental issues and problems, including piles of garbage, polluted water, land encroachment and reef damage. 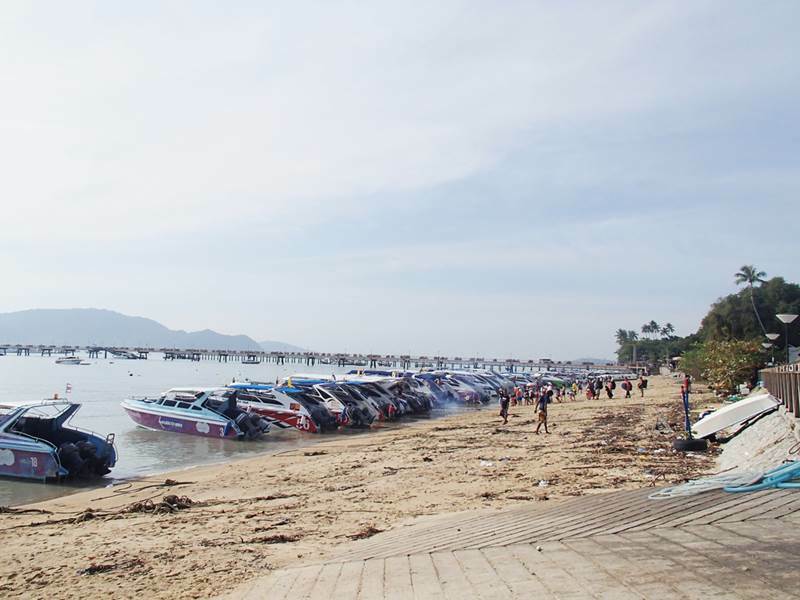 Speed boats line up at Chalong pier. 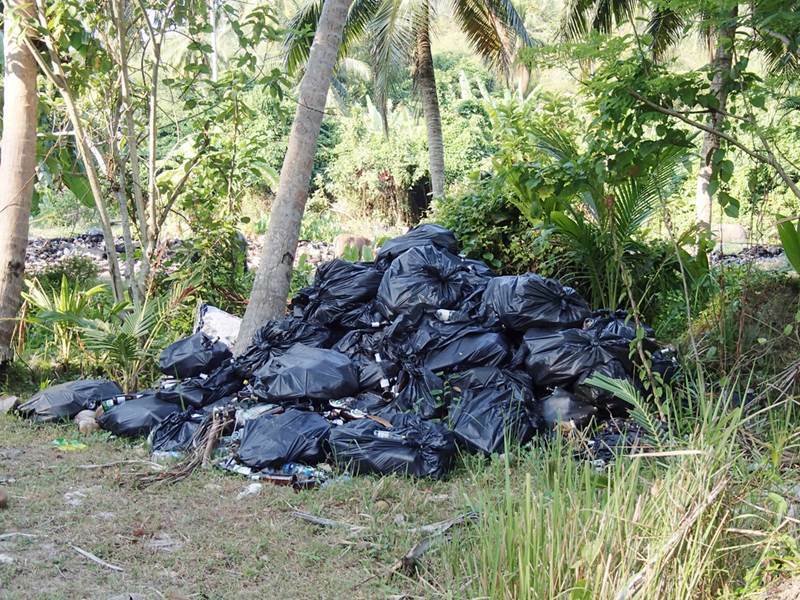 Garbage piles are easily seen throughout the island. Behide this pile is the dump site. Many of these problems are due to mass tourism of around 500 tourists a day who visit this island in low season and around 1,200-1,500 in high season. As a result of this, the IUCN – Mangrove For the Future (MFF) organised a short course on Integrated Coastal Management (ICM) and a field trip from February 18-22. As a coordinator for SEEK, I was invited to take part in this course as I actively work on environmental issues in Phuket. The working group of ICM (consisting of 26 students, mostly marine and coastal resources officers from various countries) had surveyed the island to asses the problems, and then drafted recommendations and a clear strategy towards sustainable tourism for the island. Here are their findings on the present situation: There are many garbage dump sites on the island. All these sites are not properly managed according to the Public Health act. Dirty water from the garbage directly also flows into and contaminates public canals and is released to the sea. Most waste water from hotels, local resorts and shops is untreated and is piped directly into a public canal, which unfortunately passes the garbage dumping sites, before finally ending up at sea. The only place that has a proper water treatment system is the Racha Resort. That said, many large resorts are now strictly performing garbage separation and sending recyclable waste back to the mainland on a daily basis to decrease the amount of waste that will go to the island landfills. The Racha Resort has installed an incinerator that can be used by everyone on the island. Regarding land encroachment, it was found that the illegally constructed bridge by Rayaburi is still there despite several government bodies having ordered the resort to remove it from blocking the canal. Currently water is still unable to flow and has started to form sludge in the canal. The ICM working group was also strongly concerned about coral reef damage. During the visit, they observed physical coral damage made by lack of awareness by inexperienced divers and snorkellers brought to the island by unregistered diving companies that are not members of the International Diving Association. These companies do not educate the customers about proper diving practices. In addition, barge grounding and loading of construction materials and supplies in the shallow bays is another factor that destroys coral reef as well. Local people on the island have got together and set up the Racha Yai Island Conservation and Self-care Club, registered as a community organisation to develop some mutually agreed community regulations, for example, prohibition of making fires on or near the beach, having jet skis in the bays and spreading and leaving garbage on the beach. However, as the number of tourists and resorts grow, environmental issues mentioned in this article have become more and more problematic. Fortunately, and with the hope that it is not too late, there is a lot of focus and action focused on Racha Yai Island. A strategy developed by the ICM working group is the way forward for Racha Yai Island and is focused on five management issues. Mass Tourism – It is time to regulate quotas for tour operators and monitor tour packages (time duration) as well as monitoring boat operator licenses and reduce outboard motors. Fees and taxes upon entry should be considered. Waste Management and Pollution – There is a need for complete assessment of solid waste and waste water produced on the island. Proper water treatment and incinerators need to be installed to get rid of landfills as soon as possible. Initiate zero waste among tour operators – bring garbage in, pack garbage out. Governance – Government organisations facilitate strong enforcement with adequate monitoring and maintain a standard of quality. No license issued to law breaking operators. Conservation and protection of natural resources, especially coral reefs – Local tour operators, community organisations (Racha Yai Island Conservation and Self-care club) and the Provincial Committee for Racha Yia Island Marine and Coastal Resources Management urgently need to develop and announce the zoning and limitation of activities that operate on each bay on Racha Yai Island concurrant with coral re-plantation. Communication, education and awareness – Empowering the Self-care club through several workshops. Implement best practices facilitated by government. Publish leaflets, posters and brochures regarding zero waste trip, proper diving practices. Several related government organisations have already taken roles in the Provincial Committee for Racha Yia Island Marine and Coastal Resources Management. These five management issues were presented to this committee and the first action of the plan happened on March 15 when the Department of Marine and Coastal Resources met to discuss with the community concerning zoning and the limitation of activities on the island. We look forward to seeing how we can work together with different stakeholders to ensure the future of this beautiful island.